At least Dean didn't get knocked out! Get back up! 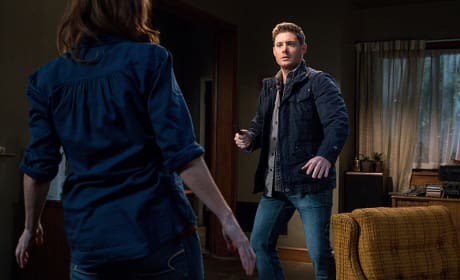 Let's hope the Winchesters haven't met their match in this ghost adventure. They still have the Darkness to face! The ghost has attacked! Or that weird stuffed animal head has attacked! Either way, Dean is prepared to take the supernatural being down. That knife should be able to do the trick. What is going on here? Is the stuffed animal head possessed? This might just be one of the weirdest cases Sam and Dean have taken on in a long time. Good luck, lady. Sam may not be able to see the ghost, but he's ready for anything. 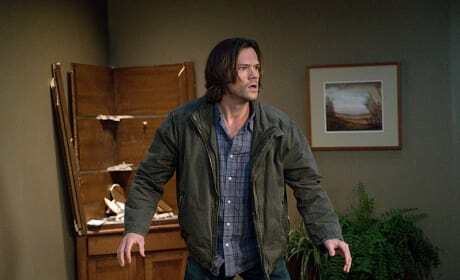 It looks like a tough battle this go around, but we all know the Winchester brothers will be able to handle this. C'mon! It's Sam and Dean! Dean's got this, guys! As long as those two stay inside the circle, no ghost is going to be able to get them. But we all know that circle is going to get broken, right? Where's Sam and Dean? 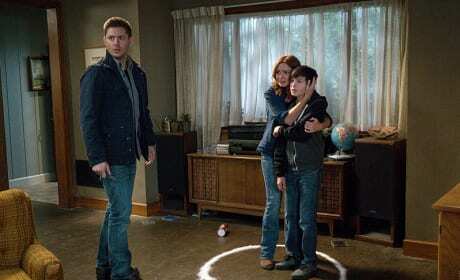 It looks like potential victims of the supernatural are freaking out over a ghost coming at them? Or is it something else? The Darkness again? 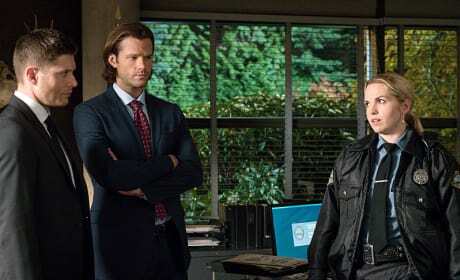 It looks like Sheriff Donna's boss has showed up to check out Sam and Dean. What goofy story is he telling the brothers? Any bets if he winds up a victim during the episode? 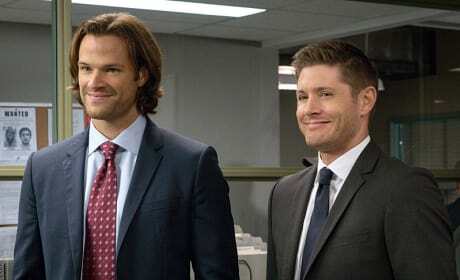 What's got Sam and Dean grinning? Did Sheriff Donna just tell a joke? These two seem to be having a great time, and it's fantastic to see the brothers still enjoying themselves while on a case. 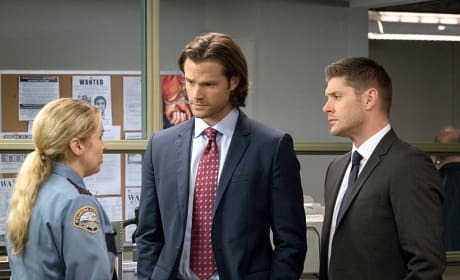 Sam and Dean are pretty focused on whatever Sheriff Donna is talking about. While she may be gushing over getting to see the Winchester brothers again, or she's telling them about the latest supernatural situation. What better way to start a case then to get a tour of the police station from Sheriff Donna? It's great to see the three reunited, and they definitely have a lot to catch up on since their last hangout. 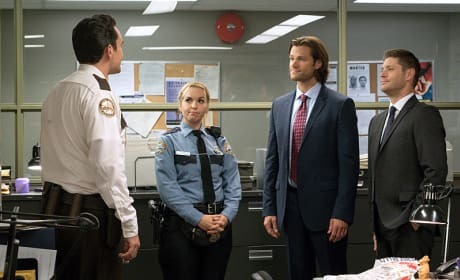 This girl either has seen a supernatural-related incident, or Sheriff Donna wants Sam and Dean to babysit for the night. Perhaps the case has something to do with that creepy mask? Donna has returned! 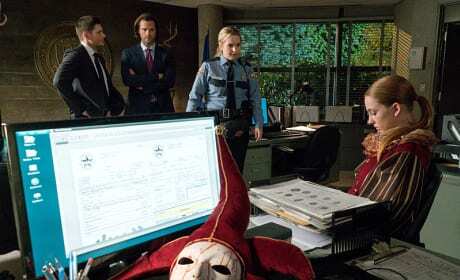 And it looks like the sheriff from Minnesota needs Sam and Dean's help with something supernatural. She's definitely giving them the lowdown on what they might be facing. Dean: Killer clown? Are you serious? Sam: No, I'm kidding, because clowns are really funny to me. Permalink: No, I'm kidding, because clowns are really funny to me. Let me guess, Rog. You were framed? Permalink: Let me guess, Rog. You were framed? 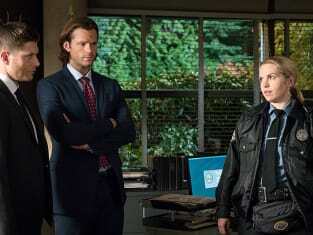 Supernatural Photo Preview: Sheriff Donna is back!